Sometimes it is very easy to forget about the reality of life! Often times in my practice, I spend a fair amount of time telling patients about the importance of self care or "me time" and how crucial it is to your health. I was reminded of that point yesterday when I woke with my left leg numb. At first I was certain it was just that I had slept on it wrong, but as the day wore on and the symptom did not improve, I had to accept that this was likely a Multiple Sclerosis symptom. I will admit that I am lucky enough to often forget that I have the diagnosis of MS. Of course, I will always have visual issues, but after 5 years, that doesn't really seem to bother me much at all. I have learned how to live and compensate with that permanent state. I reflected on this numbness and realized it was probably time to admit that I am not superwoman (although we all like to think we can be). I went to bed early last night, did not go the gym this morning and drank my smoothie before I started my day. I got to the office early and had a session in the Hyperbaric Oxygen Chamber and gave my body a chance to increase it's own stem cells to speed up my healing. I also started taking mega doses of glutathione and would have done a glutathione push if I had any extra needles at the office. Looking back at the recent weeks, our family has been going non-stop with all the daily activities. Looking forward, I know I have several more big events coming up, so taking some time now to give my body a break seems like the best thing to do. Now, if I can just realize that "me time" and down time are crucial every day, not just when things feel off, that would be perfect. Please remember to always take time for yourself and not let day to day life requirements overwhelm you. This weekend was a crazy busy weekend - but of course when the first plans were made, it was a wide open weekend! Does that ever happen to anyone else?! Regardless of the plans, I was excited for it all. Sunday, was a typical race day for me - up at 4:45 am and driving to Seattle by 5:30! Who decides that races need to start so early? How about an 11 am start time? I had been working on some speed work in the weeks leading up to this race, but wasn't planning on going for a PR this time. I had already signed up for my "PR" race for January 2014, so I was just going out to run my own race and finish strong. When I started the race, I decided that I just had to stay within sight of the 9:00 pace group and I would at least maintain a time around 2 hours. I started strong (and probably too fast) but it felt good to be running on a brisk sunny day seeing areas of Seattle that I hadn't seen running since I was in medical school! As I hit mile 5, my iPhone Runkeeper app went crazy again, and it was adding miles and having me run at speeds of 4:00 min per mile. That is very frustrating for any runner, because that constant pace in your ear at certain intervals helps you make sure you are on pace. I know I should buy a running watch - but I did order one about a year ago and they are finalizing the product. I should get it by the holidays. I guess that is one downfall with Kickstarter items, there isn't a guaranteed delivery date. Anyway, I just continued on my run and tried to keep certain people in my sight so I knew I was keeping a constant pace (as long as they were too). At the GU stop, they had a clock up - I remembered seeing the mile 7 sign, so I figured this was just past the halfway point - and the clock read 1:12:36! WHAT? I know the 9:00 pacer did not pass me - how could they be that off on their pace? Well, that was it for me and my walks seemed to get a little slower and my head was spinning with frustration. At the 10.5m turn I saw the 9:00 pacer about 15 people back and realized that I had let myself slow down considerably. I decided that PR or not, those pacers were not passing me. I started to run at a quicker speed and ignored all of the walk cues. I had the energy and I was not going to let them pass me at the very end. Just after I passed the 12 mile marker, my app let me know that my current running time was 1:50, which meant I could finish this race in under 2:00! I sprinted it to the end. When I turned the corner to the finish line, the clock read 1:56 (I started in wave 2)! I gave it everything I had and crossed the line with a new shiny PR (1:56:46)! I actually finished 4th in my age group as well. I will admit that I shed quite a few tears on this course, I guess that is a new thing for me and my races! I shed a tear or two when I thought I had fallen so far off my pace at the half way mark, when I learned at mile 12 I had a chance to finish in under two hours and as I crossed the finish line! Overall, I enjoyed this race course and felt, for Seattle, it was a pretty flat course. There were some hills between miles 7&9, the hardest miles for me in any half, but I managed to push through them. I was unable to make it to the expo, but I understand it was very small and did not have much to offer. The packet pick up the morning of the race was easy and quick with no complaints. I enjoyed running this course with a few loops so I could see and cheer on fellow friends. Will I go for a new PR in January? I am really not sure. I will just go out and run a good race and finish strong and with a smile! For now, I am excited to run the Wine & Dine Half with my husband for his first half and #12 for me (#8 for the year)! After spending Saturday afternoon relaxing by the pool with Diana and my friend Lisa (who came to visit from Murrieta), we got to bed fairly early Saturday night for the 4am wake up call! My legs were not sore at all after the 10K race and I was excited for the half marathon. This would be my 10th Half in just 18 months! It was also just over 2 years since I started running again. How exciting that my first and tenth half were both at my favorite place - Disney! This morning, I was planning on meeting with and running the half with Jill - another runDisney friend who I also first met at a runDisney meet up. We had yet to run together, but were both comfortable enough to do our own thing if we weren't running the race we wanted. We ended up being great running partners and finished together! At the start, we were already noticing the heat index was not going to be in our favor. It has been said that temperature felt close to 100 during that race and I think they were right! I will admit this was a very emotional run for me and I did not get as many pictures as I had hoped. Since this was my 10th half, I was emotional about the fact that just 5 years earlier I had been given a diagnosis that does not go well with running, but here I was about to finish my tenth half and complete the Dumbo Challenge! I felt proud of myself for pushing through, listening to my body and not letting anything stand in my way. I also spent many moments thinking of my oldest daughter, Jaide. I had run the DL half with her last year, it was her first (and last) half and we had such a memorable run together. I will admit that freshman year was not the greatest between this mother and daughter duo so I was thinking back to our fun times and remembering my joy as she crossed that finish line and had done it! One of the greatest 'mama' moments for me (and I can't wait to experience it with Taylor when she turns 13). Despite all of that, I had a race to run! Jill was not a regular Galloway runner, so we ended up running the whole race without many walk breaks, which worked out fine. The course was very similar to last year and I really enjoyed running through the rows of old cars. I am not a car person, but the pride and joy these owners take in their vehicles is so amazing. It is also fun to pass the time and see how many cars you can guess along the route. I also enjoy running through the stadium and seeing all the boy and girl scouts there cheering us on. After that point, though, it is just a straight push to the finish line! The heat was horrendous and I was learning that not drinking during my runs was not going to helpful that day. With my MS, I found that drinking during or before runs will start my bladder going into spasms, so I will super hydrate the day before and then pound 2-3 water bottles once I cross the finish line. It is not the best medical choice, but it is what works for me. This race, I really was feeling the lack of hydration and did start to drink small sips around mile 10, and I seemed to do ok with that. Crossing the finish line was amazing, but I did miss my family there with me to celebrate the fact that I had just finished my tenth half AND the Dumbo Challenge. I had done it! Jill and I hung out for a little bit in the runners area, but soon headed back to the hotel. I waited to meet up with my roomies before heading out to the parks for some last minute rides and celebrations! Overall, I enjoyed this race, but think that I enjoyed the 10K course better because it was almost all on Disney property. I also think I enjoy the half marathons in WDW better because they can have characters and Disney floats all along the course rather than just the first 3-4 miles. I am very excited for the upcoming Wine & Dine Half Marathon in November. This will be the twelfth half for me and my husbands first half. It will also be my first night time race. Just got my corral and bib information, so the time is getting close! For some reason, my pictures would not embed this post, so they are all below. One of the hardest spots for me both days because I remember taking a picture of Jaide here last year and the proud smile she had! Jaide and I at last years Disneyland Half! The weekend haul of bling!!! 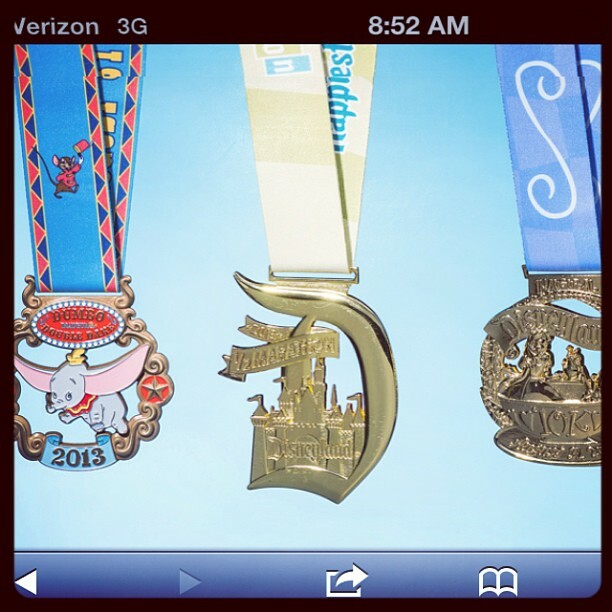 In January 2013, runDisney announced that they would be offering a new race challenge - the Dumbo Challenge! It would be a 10K on Saturday and a half marathon on Sunday. Well, compared to the Goofy challenge (half Saturday and full Sunday), this sounded much more manageable to me, so I signed up as soon as it opened! After surviving the expo (and finally getting my small shirt exchanged for an XS (note- runDisney races with unisex shirts - they run VERY large, so definitely get smaller than you think you might need)), I was ready to run the first 10K at Disneyland. 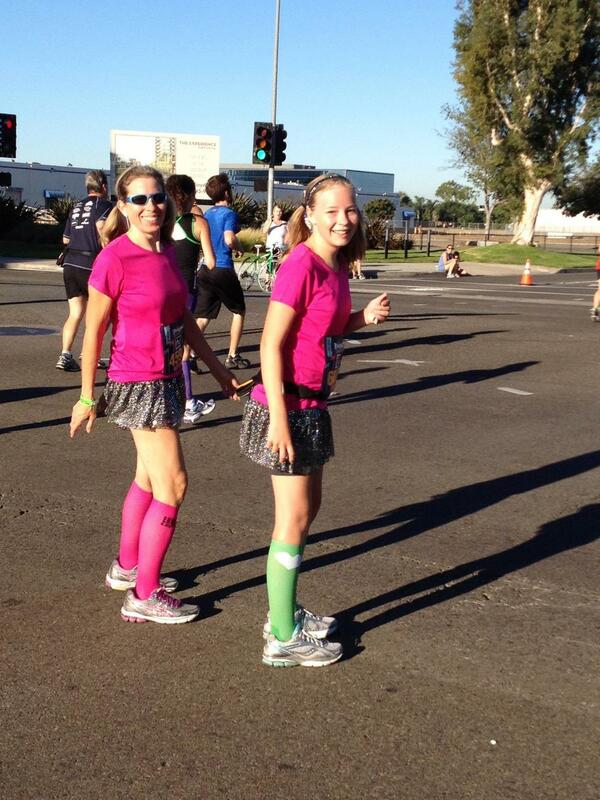 I was so excited for this race, because it was going to be a morning of fun and laughs with my running buddy Diana. My official bib, although I did not run with this bib due to timing chip error. It didn't quite start out the way I have experienced all other runDisney races due to the fact that the 5K race had started in the same area just 45 minutes before our start time. The corral area was very crowded and confused. We used the time wisely and got many pre-race pics with some other friends. The best thing about runDisney races- all the amazing runners you meet along the journey! When the countdown ended, Diana and I were off and ready to conquer this Inaugural 10K. It was exciting to see what the course would be like, since we had only run the half marathon before and hadn't studied this course that well. As a true believer in the Galloway Method, we were ready to run this 10K with a 3 minute run/1 minute walk pace. We kept this pace up for the whole race, despite the lovely heat and humidity! Di and I in front of the castle - can you see it back there? We were able to stop for a few pictures along the way, although the lines were much longer than I was used to from my previous races. So, we got the pictures we wanted and just finished with a smile! Overall, I absolutely loved the 10K race. The distance is my favorite race distance. The course was fantastic with lots of characters and fun places to look on the run. And, of course, the friends I have made over the last 18 months all there with me made it even better. I would highly recommend the 10K race to anyone interested in more of a challenge than a 5K but not quite ready for a half marathon yet. Just a group of ladies! Who would be the one character you would stop for on a runDisney race? I know for my oldest daughter - it would be Stitch and for my youngest it would be Tinkerbell or Marie! 10K complete - ready for the Dumbo Challenge tomorrow am!! When you run races, is it about the PRs? (Personal Records) Is it about the sense of accomplishment that you did it? Or is it all about having fun and enjoying the experience? For me, it's all of the above, but a Disney race will never be for me to get a PR - that happens at the Rainy Day Run in WA in January! Stay tuned for the half marathon recap coming up soon. Sorry this one is so late, got back from the race to back to school time, a move and my practice! 1. Lots of water. I know some school districts have policies which do not allow children to have any liquids with them during the day, but a doctor could always write you a note to get by this rule. The more water they drink during the day, the more they are able to flush toxins out of their system. 2. Vitamin D. Consider getting them a healthy, high quality and absorbable form of vitamin D (dosing depends on child's size, age and sun exposure) to take to improve their immune system. We sell several forms of vitamin D at the office, all safe for children. 3. Sleep. This probably doesn't affect the elementary school age kids as much, but as homework amounts increase, please remember that sleep is crucial for their growth and successful learning. Also, with a lack of sleep comes a decrease in immune function leaving them more susceptible to catching the colds. 4. Diet. Please make sure you never let your kids go to school without a healthy breakfast and some healthy lunch options. In our house, time is not our friend in the mornings, so we started making smoothies everyday. I know the girls will get their vitamins, healthy oils, protein and some fruits and vegetables before they start their day. Also, really evaluate school lunches - most of the time it is just a pile of processed non-nutritious options. I wish everyone a healthy 2013-2014 school year! Look out for future posts about my most recent runDisney experience at the Dumbo Double Dare! Bad Timing or Poor Planning?! Do you ever wonder how life can sneak up on you and something you have been planning for for months is here already?! That always seems to happen to me - but this time I don't think it was all my fault. Thankfully, I have been running regularly and did my 10K/Half marathon weekend 2 weeks ago so I feel somewhat prepared for Disneyland Dumbo Double Dare this coming weekend. When we lost the first house we owned (was our rental home at the time) to fire on 11/5/12, I never thought that the completion of the house - our move - and DDD would all happen in the same week (oh yeah and swim practice beginning and Middle school orientation for my daughters). Well, as life always has different plans, that is what happened - so - I will be unpacking boxes up until 4am on Thursday when I head to Disneyland with my running buddy Diana and conquer the Inaugural Dumbo Challenge. I have not had much time to run the last 2 weeks and hope that my months of training will leave me ready to smile, laugh and run through the parks and the streets of Anaheim! Best wishes to all the other DDD runners out there and looking forward to seeing many friends over the wekend. In January it was announced that runDisney would add a new challenge to its' lineup - the Dumbo Double Dare Challenge. This will entail a 10K run on Saturday and a half marathon on Sunday. Since I began running, I have always wanted to try the Goofy Challenge (held at Walt Disney World in January, half marathon saturday, full marathon sunday) but, to date, have not fit that into my schedule. This new challenge seemed like the perfect distance for me and I signed up right away. This race sold out within a few hours of registration being open, so I guess many others felt the same way. I think most people would be pretty excited to get these awesome pieces of bling in one weekend. I also realized that this weekend would have me crossing the finish line of my 10th Half Marathon since I started running and my 6th Half for 2013! There is no better place to celebrate that type of accomplishment than at Disney! Today marks the 2 week mark - 2 weeks from today I will be at Disneyland with my running buddy Diana ready for an amazing weekend of running, laughter and some aches, I am sure! Yesterday was the big day most runDisney runners had anticipated with some stomach flutters - the runDisney meetup announcement! I had attempted to keep an eye on the blog during my day, but seeing patients and watching a blog does not always work. I, unfortunately, did not get my RSVP in quick enough and was not one of the lucky ones chosen. Diana did get in, so at least I will hear first hand how awesome it was. Instead of running, I will get up early that day and stand in line for the expo so I can get some special memory of the inaugural Dumbo Dare weekend. I am sad that I did not make it into the meetup, but I realize that having the ability to run this race (BIG thank you to my wonderful husband and daughters for allowing me to escape to DL without them so I can run) will bring me joy and happiness! Every time I hit the pavement to run another race I quietly say thank you for still being able to run despite my diagnosis of MS.
Big congratulations to all my running friends who did make it into the meetup - enjoy it! And to everyone out there, runners or not, remember to cherish every step you take! There will be some sadness not having my "twin" on the course with me this year! Jaide was a great partner for DL Half last year! Post 10K last weekend with Scott. He is starting his training for the Wine & Dine Half in November! As I became more involved in the racing Facebook groups and websites, I learned of a an interesting fundraising idea that many runners utilize: virtual races. Virtual races are ones that you sign up for and complete within the expected time set up by the organizer. It is a great way to increase your bling collection or help friends get to the races they are raising money for or support a cause you feel is worthy. For the next three months, I am trying out Jost Running and their virtual race program. The month of August is dedicated to the ALS Association. I went out this morning and ran my 5K and thought of one of the most wonderful woman I have ever known; Toni Erickson. She battled this horrible disease with such courage and beauty. We lost an amazing person when Toni passed last year, but the miracles she brought to the world remain because of the lives she touched! She was one of the local midwives in our community and my personal midwife. I know our family will always remember "Grandma Toni" every year when we celebrate my daughters' birthdays. I really enjoyed running this morning, even though it was on the treadmill, having something positive to think about. When I first learned about the virutal races, I thought it was just a great way to gain more bling for my wall, but I never signed up for any. After today's run, I think it is a great way to support others and bring meaning to some of those dull training runs - or a way to add another race to a "raceless" month. Please take a look at the Jost Running site and see if any of the upcoming runs look like something you may want to try. Also, you do not have to be a runner - because these races are done on your time in your schedule, there are no time limits and walkers are accepted too! Good luck and happy virtual racing! At least once a week I am asked - "Why do you run so often?" or "Why do you try and run so many miles a week?" or even "Why do you run?" I have a history of being a runner - although never competitively. I ran in college with my girlfriend Ali as a way to fight those freshman 15. I ran in medical school, around Greenlake, as a way to handle to stress. Then my knees starting giving me troubles and I stopped running. When I was given the "challenge" to try for the Coast to Coast Medal by running the runDisney Princess Half Marathon and the runDisney Disneyland Half Marathon, I decided to go for it and see how things went. Well, that was it, as people around me know, because I am now in the middle of my race a month year and loving every mile that I put on my shoes! So, I started running to see if I could run and finish a half marathon but I continue to run to make sure that Multiple Sclerosis doesn't get the best of me (and I do have an affinity for the bling at the finish line). My exchange "sister" from when I was 16 is also a runner! We stayed in touch for a few months after our exchanges were over, but lost touch for over 10 years. Thanks to Facebook and Jo's search, we are connected again and have learned that we are both runners. I don't think either of us would have thought this would be a common habit we would share, but it is fun to cheer each other on from a distance. Jo runs marathons. I am not there, yet! This morning she shared a link with me of a woman who just finished running 366 marathons over 365 days! Yes, you read that right, she ran a marathon a day for a year. That is impressive enough, but she too has a diagnosis of MS! She wondered if her mind and body could push through the diagnosis and complete such an amazing goal. She has broken the world record! In my mind, she is a testament to the power of exercise and goal setting! Way to go Annette! I have a set a smaller goal for myself, but a goal just the same. My goal is to run a race a month - originally it was for a half marathon a month, but that didn't work into my schedule. I ran a 5K with my family in March and a 12K in April and then every other month has a half involved. No matter where you start, or how fast you run, crossing the finish line feels the same to everyone! It is an accomplishment - whether it is a 5K, 10K, half or full marathon! So, set a goal and get out there and accomplish it! 366 marathons in 365 days! Sometimes, I question which direction i should approach certain issues, such as hydration. Doctor perspective: We should all be drinking at least 1/3 of our body weight in fluid oz of water per day + 8 oz for each vice. For some of smoking patients, that last part is overwhelming, but it is crucial. A vice can be one cigarette or one cup of coffee or one alcoholic drink. So, if you are a pack a day smoker and you weight 150#, you should be drinking at least 210 oz of water a day! This alone might be a good way to help cut down on the number of cigarettes you smoke. You should also drink 8oz of water for each 20-30 minutes of exercise. So, the 8 8 oz glasses theory is not really meant for a one size fits all because it is possible to overhydrate (although very uncommon). Athlete perspective: As a runner, I know the importance of staying hydrated before and during workouts. I would look at the sports drinks on the market and my doctor side would shine through. How could something with tons of sugar, food dies, wheat or similar be any good at rehydrating a person? In my search I found Nuun, a Seattle based company and my new favorite drink post runs. It does not contain any of the above mentioned ingredients and it does what it should do; helps to rehydrate or stay hydrated. Multiple Sclerosis patient perspective: Due to the first two thought processes, this one is more difficult. I know what I should do; but I also know what my body will allow me to do! Although I do not have any bladder issues with my MS, for some reason, when I start to run, my bladder feels irritated. I could stop every minute if I let myself, but it would not help the situation. Due to this, I do not drink during any of my workouts or races. I know, this is not optimal, but it works for me. I make sure I drink plenty of fluids the day before a big race and drink a ton once I cross the finish line. I think drinking something like Nuun helps to keep me hydrated during the runs. Take home point - Water is a necessity for everyone! However you stay hydrated - drink your water. And, if you are someone who likes electrolyte type drinks, make sure to read the labels and know what you are drinking. Note: I am not affiliated with Nuun just happen to love the product. Saturday, June 22, marked my 8th half marathon! I can't believe it was only 16 months ago that I completed my first half, and now I have finished my 8th. Last year RocknRoll announced a new "Heavy Medal" called the Pacific Peaks - which you would get if you ran both the Portland Rock n Roll in May and the Seattle Rock n Roll in June. Extra bling?! Sign me up! So, my Rock n Roll running partner and I were ready for the challenge and completed the Portland one in May using my 5 minute run/1 minute walk intervals. The official time was 2:10:55 - pretty good time for us considering we hadn't run together in almost a year! You can always tell if it was a good race by the smiles at the finish line! Oh wait, that is the look of: "Phew, It's over! " So, with one half under our belts, we had about a month until Seattle. When this race started, Mary decided that she wasn't sure she liked the run/walk method and wanted to try running this one straight. Ok, let's give it a try! I really wasn't sure I could run all 13 miles without a walk break, but figured there was no way to know without trying. Our husbands made the trek around the city to cheer us on at a few locations, which always helps to get those feet running faster! Our official time for the Seattle RnR was 2:08:31 - about 90 seconds faster than Portland. So - was it worth it to go without the walk breaks? I am not sure. The reason this was an unofficial comparison - it was different weather (warmer in Seattle), different courses (I think Seattle was a bit more hilly, but not quite sure), different scenery, and a necessary pit-stop on the Portland course which could have been a bit over 2 minutes. I will say I was very happy that I was able to run this half without walking at all and was still able to walk the next day! For now, I think I will continue with the Galloway Method and be happy to keep crossing finish lines! Someday I will gear up to beat my PR of 1:59, but not in 2013. Big news (sad that we have to wait for the AMA sometimes) in the medical world was released today - the AMA (American Medical Association) has officially voted to classify obesity as a disease. What does this mean? Bottom line - it should become easier for patients to get nutritional counseling, help with weight loss and even bariatric surgery if all else has failed (please note, I do not believe that bariatric surgery should ever be the quick easy solution and should not be considered unless all else has truly not worked). Based on articles the direct cost of obesity is estimated to be over $535 billion a year! Yes, you read that correctly, 535 billion. The hopes by this change in disease classification is that this cost will decrease as people begin to experience healthier lifestyles and lives. The one concern is that this will become a crutch for some overweight individuals and using this new "disease" as a reason for their weight issues, rather than working towards improving their health. As with any changes, this is going to be a wait and see time frame - physicians and patients will have to wait and see if insurance companies do change their policies on covering nutritional counseling or weight loss support. My personal hope is that they will, and quickly! As a country with over 35% of its' population considered obese, it is time for a change. At Rainier Natural Health Clinic, we offer several different types of lifestyle courses and weight management programs. If you are interested in learning about them, please call the office (360-829-1838). Remember, weight loss is not a quick fix - it is a lifestyle change that will help you lose weight, feel great and live a more active, healthy life! As I was running my 6 miles this morning, I started to wonder how other people keep conditioned when running multiple long races in a row? May began my stretch of a half marathon a month for 7 months and I wonder if I need to hit double mileage for my long runs every week now, or if doing a 11/12 mile run 2 weeks before the next race will work just fine. As much as I love to run, not having a running companion to hit the trails for those long run days make the training a bit more difficult. I love the area that I train around - often seeing Bald Eagles, deer or even the local ostrich who loves to chase the fence line with me - but don't enjoy being out there for a few hours alone. How do you help pass the time if you are a solo running? Do you end up working out more on treadmills or changing up your music daily? Disney Princess Half Marathon Blues! It's that time of year again - registration for the Princess Half! For more information on this race, go to the runDisney page linked at the bottom of this post. Not sure why runDisney decided to start adding 10K races to their current half marathon weekends, but they did it again and added a new challenge to the Princess weekend called the Glass Slipper Challenge. This will be a 10K race on Saturday and the half marathon on Sunday. As much as I wish I could find a year where I could run every runDisney race, 2014 will not be that year. I get to participate in the inaugural Dumbo Double Dare Challenge, but will not be able to run the Princess for the 3rd year in a row. This race will always hold a very special place in my heart because it was the race that made me a runner! I got to WDW in 2011 promising that I would run this race and never run anything longer than a 10K again. I left WDW with a new obsession for bling (like most runners learn early on), many new running friends and a desire to run many more half marathons! I still haven't decided if it was the Disney magic, the amazing people I met or feeling that bling around my neck that made the difference, but it doesn't matter - a runner was born. So, today, registration opens for everyone to sign up for the Princess Half Marathon or the Enchanted 10K, the Glass Slipper Challenge or the Royal Family 5K. I wish all those princesses out there good luck on their registrations and their training. I will be with you in spirit through social media updates from all my fellow princesses! Why am I not running it again in 2014? I need to focus some time on family vacations and traveling when my daughters are on school breaks. I am also enjoying finding other local races to run - although destination races will always be my favorite. I will be back to run the Princess Half again, just not in 2014! Are you signing up for the Princess weekend? Will this be your first half? Can't wait to hear all the details, and for now I will keep training for the Dumbo Challenge over Labor Day! As a doctor and a runner, I am often asked what I think of this product brand or another one. Typically, my answers are the same - where is the research? do they third party independent test each batch? what type of quality control do they adhere to? It is not often that I do end up reviewing or trying out products because I expect the best from companies. Recently, I contacted energybits (link at bottom of review) to see if I could try out their spirulina algae tablets. I liked the fact that there was nothing else in the tablets but the algae. Last week, I went to gym dreading my afternoon workout (it happens even to the best of us) but knew that I had to get in an additional run that week. I was tired, my head was feeling fuzzy and I was unmotivated - perfect time to try out these bits. I took 15 of them (suggested dose is 30 tablets, but I wanted to start slow) and headed in to the gym to hit the treadmill. My plan was to run 2 miles just to say I ran - but before I knew I had run 4.35 miles (and felt like I could keep going) and realized I was going to be late picking up my daughters from school! As I drove my "taxi" job, I thought back on my run and realized that I had a clear head, almost felt like things seemed brighter and was full of energy! I definitely left the gym after my run a much different person than I had entered. My husband called and asked me how was I doing and I told him I was great! He asked me what was up and I explained my experience. The next thing he asked - when can I try them?! I immediately emailed Jonathon at energybits and told him my experience - I was wondering how great I would feel at a "full" dose. Since then, I am happy to say I have become an energybits ambassador and am happy to offer any of my clients, friends or readers a 30% discount off of their purchases by inputting the discount code: dockaylee at the shopping cart screen. Have your tried energybits? What are your thoughts? Please share and let me know. I hope to have more updates on the benefits of algae as I continue my personal trials of the bits. Happy National Running Day! I realize not everyone who might read this blog is a runner or a jogger or an interval walk/run person, but take today to get outside and do something for yourself and your body! I know why I run - do you know why you run? Do you have special plans to get out with friends tonight for a jog in the beautiful weather? Are you going to Seattle to run with the Rock n Roll Group around Greenlake? Or, are you just going for a nice stroll with friends or family? Whatever you decide to do, get out there and do something today! A little over a year ago, I ran my 3rd half marathon - the Seattle Rock n Roll with my friend Mary. At that run, they announced a new medal (and I have already admitted that I am 100% addicted to bling) challenge called the Pacific Peak. You would run the Portland RnR in May and the Seattle RnR in June and get the Pacific Peaks medal. Sign me up! I ran 13 miles about 2 weeks before this half and knew I was ready for my next race. We headed down to Portland on Friday night so we could relax a little bit on Saturday and explore this fun city. Saturday, we hit the expo which, unfortunately, had been moved to north of the city and near the event hotels. As I was told, someone had double booked the downtown convention center, and RnR was told they needed to move locations. I know this was a big frustration for many runners. Once we had gotten back to the hotel, we took a walk so that I would know where all the events and meeting spots would be the next morning. The fountain was not running during race day, but still served as a good meeting spot. The fountain was right near my start corral, so it was easy to find and a short walk from the hotel. Sunday morning, I woke up and got ready and headed out to meet friends. In the last year, races have become so much more fun because I always get to see people that I know and catch up with them. After some pictures and laughs, it was time to get into the corrals and wait for GO! We were off and Mary was going to try the Galloway Method with me - a run-walk method. This is the method that I started using in the fall of 2012 and the same method that I used when I got my 1:59 PR for my January Rain Run Half. I love this method of running and am still amazed that it allows me to run faster than running straight. Mary and I managed to make it up all those crazy hills, cross the 2 bridges, enjoy lots of bands along the route, and cross the finish line in 2:10. Overall, I enjoyed the course (just wish I had done more hill training beforehand) and the bands were good. I really love running with friends because catching up on life certainly makes the 13.1 miles go by much faster. Mary and I at the finish! I am looking forward to Seattle RnR next month and crossing one more half off my list! What are your favorite races to run that are close to home? Do you enjoy the larger formats or the smaller hometown type runs? Scott photobombing my finish line pic! I awoke this morning to news of Angelina's preventative double mastectomy on Facebook. A good friend from high school, and breast cancer survivor had put up a status about Angelina and her hope this will enable more women to be aware and get tested. Often times, I am asked about my personal opinion of mammograms due to the radiation exposure. That is a difficult question for me to answer without bias - and I do let my patients know my whole reasoning. Already a cancer survivor - Mema still looks radiant! When I was born, my maternal grandmother - "Mema" as all who are close to me would remember her - was first diagnosed with breast cancer. At the time, she chose to have a unilateral mastectomy Sixteen years later, the other side showed signs of cancer and she went in again to have the other breast removed. During those years, I guess I didn't really understand the extreme severity of breast cancer and just assumed Mema would be fine. She was a strong woman and when she passed on at the age of 90, she did not die from cancer but other health conditions. When I was 28 years old, my mother was diagnosed with breast cancer. At the time, she found it difficult finding any surgeon to just perform a double mastectomy so she went through a lumpectomy, radiation and some naturopathic support. Within the same year, the other breast showed a questionable mass and my mother was done. She searched through Connecticut until she found a surgeon willing to perform the double mastectomy she had wanted from the beginning. This November will begin my mother's 15th year since her diagnosis, and she is still currently cancer free. My beautiful mentors who taught me to fight any diagnosis with strength and courage. So, my answer to the question about mammograms - yes, I am in favor of mammograms regardless of the radiation exposure. I am all for anything that will help give us a chance to save lives, improve the quality of life or support prevention. *Twenty percent of Ashkenazi Jews who have been diagnosed with breast cancer before the age of 40 have a BRCA1 mutation. *Twenty-nine percent of Ashkenazi Jews with a family history of two or more breast cancers carry one of these mutations. Thank Goodness we don't have any history of ovarian cancer in our family! Even before the Angelina Jolie news hit the media today, my mother had already begun working on getting the BRCA genetic testing done, and if she ends up being positive, I will go in myself and be tested. As much as I have a concern for my own personal health, I also have a fear for my beautiful daughters' future. I will be tested so that they know early on if they should be tested. I will be tested to maintain my health. If I end up being positive, I will decide at that point what my next step will be. Four Generations of Strength and Beauty! What is your opinion: Do you get regular mammograms? Would you get tested for the BRCA gene if you had a family history? Would you ever consider getting a preventative masectomy? I would like to add a special note of love to all the women in my life; Mema, Mom, my friends and patients (you all know who you are) that have shown such strength and courage to battle and continue to overcome breast cancer! They say it takes 3 weeks to make a habit and 3 days to break one. I believe that statement and it terrifies me! After I ran my first half in Feb 2012, I came back home to the wonderful wet and cold winter of the PNW and didn't get out and run much at all. My next half after that was in June and I could feel the lack of training everywhere that afternoon. It was also my slowest solo half time at 2:15. Personally, I know that the better weather helps so I can actually enjoy some nice long runs on the trails in my area and can enjoy the scenery. I have changed up my music so that I am excited when some new songs come on and I can feel the increase in my pace based on the beat of the songs. I also make sure that I have at least one race per month scheduled now so that I have to stay focused and training at all times. Deep down, I know what drives me to keep running 3-4 times per week is the knowledge that I have never been healthier since I started running! I have lots of future races to look forward to; including the Peak to Peak Rock n Roll Challenge (running Portland Half in May and Seattle Half in June), my local Buckley Rails to Trails half in July, runDisney Dumbo Double Dare Challenge in August/September, Biggest Loser Half in October and the Wine & Dine Half in November. Each of those races will include lots of great conversations with great running friends and some firsts for us all. So, every day I have a workout scheduled, I get up, throw on my running shoes and hit the pavement to stay healthy and happy! So, the question for today is: What do you to do to keep yourself motivated? Does changing up your run locations help? What about asking friends to join you on the training days? How about adding in some cross training with weights or biking? And, when the blahs are overwhelming, what drives you to still get out there and run? It always surprises me how many times I end up having conversations with first time patients about the importance of taking care of themselves! During my initial visits, I typically spend about 40-45 minutes finding out their health concerns, health history and other details about their lives. I always ask questions about what they do for fun, the exercise in their life, how they handle stress and sleep habits. Some of those sound like common questions for a doctor's appointment, but not all. Whether you are a mom to 5 children, pregnant, a nanny or a pet owner; Carpe Diem and take some time daily or weekly for yourself. It doesn't matter what you are doing as long as it is something that is fun, relaxing and just for you. There is nothing selfish about planning "me time" into your hectic schedule. Today's post is going to be short so that I can head outside and enjoy a rare and unusual sunshine filled Tuesday in the Pacific Northwest and follow my own advice!